Super durability with American-made top grade high strength cold rolled steel construction. Sale Prices Come in Green Uprights & Orange Beams & Ship in 48 Hours. Custom Colors ship at standard production lead time. Custom colors might have an up-charge check with your sales rep for a formal quote! Selective Rack Systems provide cost-effective solutions for high-capacity storage needs. Flexible adjustments on 3? increments for Keystone and 2? increments for Tear-Drop. 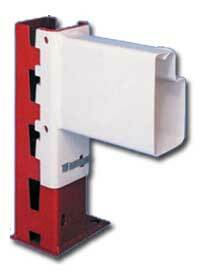 Features integral safety clips so beams lock into place preventing uplifting and dislodging when load is retrieved. 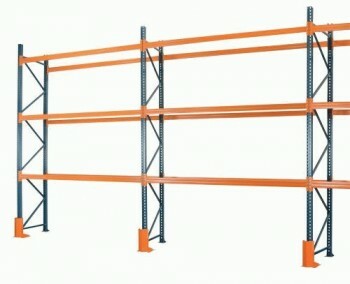 Rugged pallet racks assemble quickly and tightly with boltless beam connections. Premium powder coat finish is the industry?s most durable high gloss finish. Complies with RMI, AISI and AISC specifications. FOB Shipping Point. Upright Frames and Beams are available in the following powder coat color options: Winter Gray, Channel Green, Marine Blue, Solar Black, Decorator Tan, Signal Orange, Safety Yellow, Cardinal Red, Dover White, CD Green and 84 Blue -- please specify. please verify the weight capacities with rep some have changed! Product No. Size D x H Cap. (lbs.) Wt. (lbs.) Price Ea. Product No. Size W x H Cap. (lbs.) Wt. (lbs.) Price Ea.